Are you considering applying to Hunter College or a current student? These resources from Hunter’s Office of Admissions share information about Hunter College. HCAP translated these materials into several Asian languages, so students and families can learn more about Hunter in their native language. Feel free to share these resources with parents and community members! The Hunter one-pager is a quick, easy to read overview of main statistics and key information about Hunter College. The Hunter brochure shares a full overview of all that Hunter College has to offer including: admission statistics, academic programs, student population, campus information and a range of programs and activities. 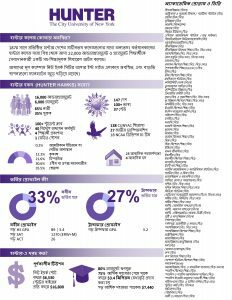 Click to download the 2017-2018 Hunter College One-Pager and 2017-2018 Hunter College Informational Brochure in Bangla or English. For more information, visit the Hunter College Admissions Website.